Let's go trekking for 2 hours at Pha Dok Siew Nature Trail! You'll get to visit rice terraces, swim at a waterfall, see & taste organic coffee right here, all in one day! Let's visit the Rainbow Waterfall (Wachirathan Falls) where you can see the rainbow from the highest waterfall in the national park! Next, we'll visit a twin pagoda up in the mountains with a bird's-eye view of the beautiful flower garden! Visit the summit of Doi Inthanon, which is universally known as the highest peak in the country! Next, let's see the local market (Hmong market) where you can shop the local food and produce! Time for some lunch with delicious Thai food! 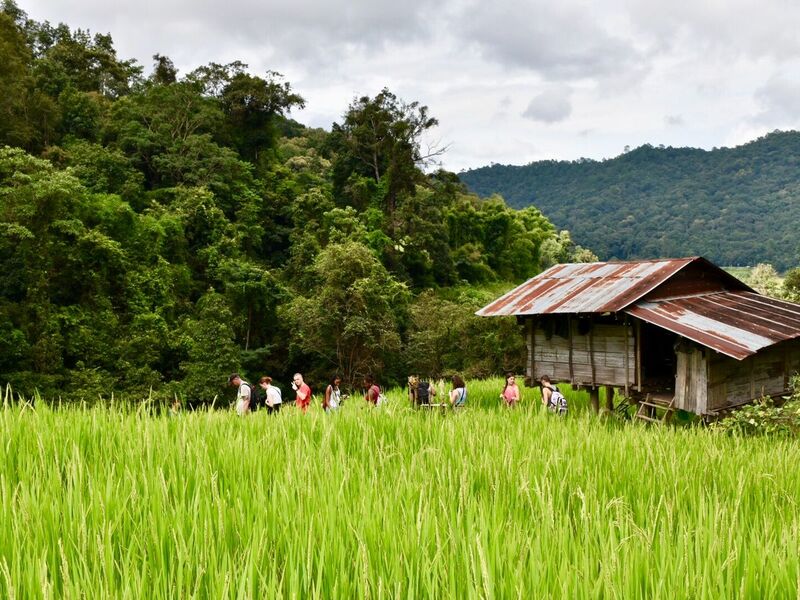 We'll trek for 2 hours to the Pha Dok Siew Nature Trail to see rice terraces, swim in the waterfall, visit the organic coffee farm and taste local coffee (non chemical) served by the local Karen tribe! We've reached the end of the trip! Thank you for joining me! Hope you had fun! The most beautiful trip in Chiangmai. Trek to the Peak: Doi Inthanon and Kew Mae Pan Nature Trail! What an amazing experience for our family! Methanon was SO knowledgeable and taught us all about the plants and animals that we saw, as well as the cultural traditions of the area. He really worked hard to make the experience special for us. This trip was a highlight of our trip to Thailand! The sites were excellent, the pagodas and the surrounding gardens are a real highlight of Thailand. The trek was a journey into another side of Thailand. Highly recommended.